The five artists featured in Masks: The Magic of Transformation come from a variety of artistic backgrounds and the masks they create reflect that. These visual artists also describe themselves as actors and performers, using the masks they’ve created to transform themselves into someone or something altogether different. Working with a variety of materials including paper mache’, feathers, textiles, paint, chicken wire, raffia, and clay to create their masks, these artists’ completed works conjure up an array of characters and beings brought to life once worn. 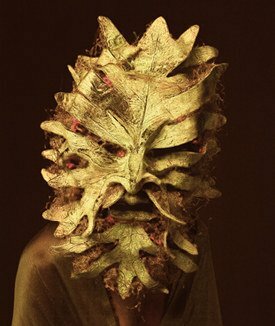 Each one of the artists brings a unique and distinct vision to his or her masks, making for an exhibit of tremendous imagination and creativity. Eric Bornstein‘s powerful and finely crafted pieces, which have been created for theatrical productions, including mythical dragons, faces from Homer’s Odyssey, characters from The Chinese epic, The Monkey King, and images recalling Japanese Noh Theater are stunning in their variety and execution. Deborah Coconis‘ delightful visages reveal a quirky sense of humor along with an idiosyncratic, yet eternal, female elegance. Her Kuan Yin demonstrates the manner in which she takes a well-known character and makes it her own, creating new depth to the mysterious personage. Together, these five artists present a formidable collection of mask images, which we hope will stimulate a greater public awareness of, and dialogue about, the magic of mask transformation.